A marching band is a group of instrumental musicians who generally perform outdoors and who incorporate some type of marching or other movement with musical performance. Instrumentation includes brass, woodwinds, and percussion instruments, and the music usually incorporates a strong rhythmic component suitable for marching. A marching band not only performs musical compositions, but also entertains with flamboyant steps and movements to create a moving musical ensemble, sometimes forming designs such as letters, logos, or even animated pictures. In addition to traditional parade performances, many marching bands also perform field shows at special events such as football games or at marching band competitions. Marching bands are generally categorized by function and by the style of field show they perform. Increasingly, marching bands perform indoor concerts that implement many of the songs, traditions, and flair from their outside performances. Evolving out of the tradition of military bands, marching bands have evolved a rich and varied tradition of musical styles and marching traditions, ranging from the traditional martial music of John Philip Sousa and comedic routines to contemporary Rock and Roll and Rhythm and Blues. Marching bands evolved out of military bands. As musicians became less and less important in directing the movement of troops on the battlefield, the bands moved into increasingly ceremonial roles. 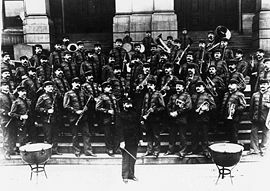 In the late nineteenth century, they became increasingly popular features of American life in part through the musical work and leadership of John Philip Sousa, who headed the U.S. Marine Band from 1880 until 1892. Sousa wrote many well known march tunes and began a tradition of take the Marine Band across the country for an annual fall concert tour, later forming his own band which tour widely in the U.S. and Europe. Many military traditions and terminologies survive in modern marching bands. Bands that march in formation will often be ordered to "dress" their "ranks" and "cover down" their "files." They may be called to "attention" and are given orders like "about face" and "forward march." Uniforms of many marching bands still resemble military uniforms. 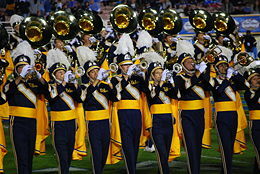 Outside of police and military organizations, the modern marching band is most commonly associated with American football, especially the halftime show. 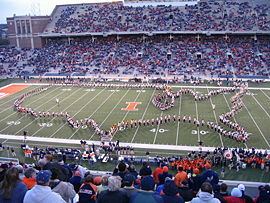 The first halftime show performed by a marching band at a football game was the University of Illinois Marching Illini in 1907, at a game against the University of Chicago. Another innovation that appeared at roughly the same time was the fight song, which are often closely associated with the university’s band. Three well known university fight songs are The University of Michigan’s “The Victors,” Notre Dame’s “Victory March,” and the United States Naval Academy’s “Anchors Aweigh,” all of which are also used by various high schools throughout the United States. Other innovations in the marching band tradition include the addition of a dance team, majorettes, and color guard members. Marching bands can be categorized based on primary function, instrumentation, and style. Military bands are historically the first of the various marching bands. Instrumentation varies, but generally contain brass, percussion, and woodwinds. Given their original purpose, military marching bands march forward only usually in straight lines; they rarely make curves. Active-duty military marching bands often perform in parades with other military units and march in the same manner as other military personnel. Music is played at a constant tempo in order to provide a steady beat for other military units. Almost all military marching bands have disappeared from schools in the United States. Two notable exceptions are the Fightin' Texas Aggie Band from Texas A&M and the Highty-Tighties of the Virginia Tech Corps of Cadets. In addition, there are about 80 high school military marching bands in East Texas. 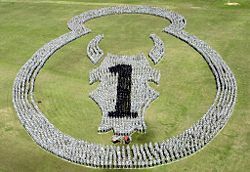 These bands have formed the National Association of Military Marching Bands in order to preserve the tradition of military marching. Parade bands generally play marches. Instrumentation varies, and can contain anything from bagpipes or fifes and drums all the way to full wind and percussion sections. Many military and veterans' organizations maintain parade bands. Show bands have the main role of performing at sporting events and competitions, such as American football games. They often perform a field show before the game and at halftime. Show bands typically march in time to the music, and may also participate in parades and competitions. Show bands contain brass and percussion instruments; they may or may not use woodwinds or a percussion pit. Typically, the show is not merely marching in lines, but involves creating designs, curves, letters, and moving illusions as their music progresses during the show. Carnival Bands are a British variant of show bands. Scramble bands are another variation on show bands. At times they do not march in time with the music, but scramble from design to design and often incorporate comedic elements into their performances. Most of the bands in the Ivy league use this style. HBCU bands, referring to Historically Black Colleges and Universities, are another variation on traditional high-stepping bands. HBCU bands started as athletic support for football teams and have grown to be featured in movies, various professional sporting contests, and political events. They are known for their traditional high stepping style, musical repertoire ranging from Top 40 hits to classical marching band literature, and cutting-edge choreography. There are over 100 known HBCU bands. 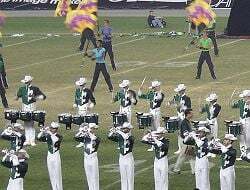 Drum and bugle corps is a genre of marching ensemble descended from military signaling units that is distinctly divided into classic and modern corps. Both groups have long, continuous histories and developments separate from marching bands. As the name implies, bugles and drums form the musical background of the corps, but modern competitive drum corps incorporate other brass instruments and orchestral percussion. Governing bodies of competitive drum and bugle corps include Drum Corps International (for junior corps) and Drum Corps Associates (for all age corps) in America, Drum Corps United Kingdom and Drum Corps Europe in Europe, and Drum Corps Japan in Japan. Bugle bands are a subset of military bands that use non-valved instruments, typically B-flat bugles. Some bugle bands, like the Burgess Hill Marching Youth, extend their range by using instruments such as the jaghorn. The size and composition of a marching band can vary greatly. Many bands have fewer than 20 members. Some have over 500. American marching bands vary considerably in their exact instrumentation. Some bands omit some or all woodwinds, but it is not uncommon to see piccolos, flutes, clarinets, alto saxophones, and tenor saxophones. Bass clarinets, alto clarinets, and baritone saxophones are more likely to be found in a high school marching band, while bassoons and oboes are very seldom to be found on a field. Brass sections usually include trumpets or cornets, mellophones (instead of French horns), B-flat tenor trombones, euphoniums or baritones, and sousaphones or tubas, often configured so that they can be carried over the shoulder with the bell facing forward. E-flat soprano cornets are sometimes used to supplement or replace the high woodwinds. Some especially large bands will use flugelhorns to cover the lower trumpet parts. Alto horns can also be used in place of the mellophone, although this is rare. Bass trombones are also sometimes used, especially in large bands. 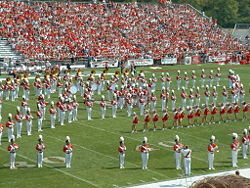 The Ohio State University Marching Band is the largest all brass band in the world (comprised of brass and percussion) and its instrumentation is based on the traditional English brass bands utilizing flugel horns, E-flat alto horns and E-flat cornets in addition to trumpets, trombones, baritones, and tubas. Marching percussion (often referred to as the drumline or back battery) typically includes snare drums, tenor drums, bass drums, and cymbals. All of these instruments have been adapted for mobile, outdoor use. Marching versions of the glockenspiel (orchestra bells), xylophone, and marimba are also used by some ensembles. For bands that include a front ensemble (also known as the "pit"), stationary instrumentation may include orchestral percussion such as timpani, wood blocks, marimbas, xylophones, bongos, vibraphones, chimes, as well as a multitude of auxiliary percussion equipment. Until the advent of the pit in the early 1980s, many of these instruments were actually carried on the field by marching percussionists. Some bands also include instruments such as synthesizers, electric guitars, and bass guitar. If double-reed or string instruments are used, they are usually placed here, but even this usage is very rare due to their relative fragility. Large bands also require a number of support staff who can move equipment, repair instruments and uniforms, and manipulate props used in performances. In high school bands, these activities are usually performed by volunteers, typically parents of band members or the band members of the lower grades. Many bands have auxiliaries who add a visual component to the performance. For ceremonial bands, this could be a traditional color guard or honor guard. For drum & bugle corps and corps-style field bands, this could include dancers, majorettes, or some type of drill team. Auxiliary units may be collectively referred to as color guard or visual ensemble. Auxiliaries may perform as independent groups. In the early 1970s, color guards began to hold their own competitions in the winter (after the American football season, and before the beginning of the summer drum & bugle corps season). There are also numerous dance competitions in the off-season. Some bands, primarily military bands, use a simple walking motion. This is done to conform with military regulations regarding marching and to conform with "what everyone else is doing" in order to appear more uniform. Many bands use some variation of the glide step, also known as the roll step. This step involves bringing the heel gently to the ground with the toe pointed up, and then rolling forward onto the toes before lifting the foot. It gives the drill a fluid and smooth appearance, and allows for better control of the difficult formations and various styles of music played by those bands which roll step. In addition, roll stepping allows for a much broader range of tempos to be performed well: The proper execution of a roll step will give a player marching at 40 beats per minute the same smooth tone as a player who is marching at 180. The proper form prevents the wind player from bouncing and moving around unnecessarily, thus producing an unstable tone. Marching percussionists generally use a roll step exclusively, as drum harnesses (especially in the case of marching snare and tenor drums) make a high step impossible. Along with the roll or glide step, there is also a "high step." 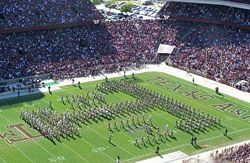 Many traditional style colleges and universities such as The Ohio State University Marching Band, the University of Southern California Spirit of Troy, and The Pride of Oklahoma Marching Band execute this style as do most Historically Black Colleges or Universities. Some secondary schools that have deep tradition in their marching band also utilize a high step. For parades, bands usually line up in a marching block composed of ranks (rows) and files (columns). Typically, each member tries to stay within his or her given rank and file, and to maintain even spacing with neighboring musicians. It is usually the responsibility of the people at the end of each rank and the front of each file to be in the correct location; this allows other band members to guide to them. Band members also try to keep a constant pace or step size while marching in parade. This usually varies between 22 and 30 inches (56–76 cm) per stride. A step size of 22.5 inches is called 8-to-5 because the marcher covers five yards (about 4.6 meters) in eight steps. A step size of 30 inches is called 6-to-5 because five yards are covered in six steps. Because yard lines on an American football field are five yards apart, exact 8-to-5 and 6-to-5 steps are most useful for field shows. A drum cadence (sometimes called a walkbeat or street beat) is usually played when the band is marching, sometimes alternating with a song. This is how the band keeps time. Alternately, a drum click or rim shot may be given on the odd beats to keep the band in step. Between songs and cadences, a roll is usually given to indicate what beat in the measure the band is at. Cadence tempo varies from group to group, but is generally between 112 and 144 beats per minute. Each member can move independently—this is called scattering or "scatter drill"
Many bands use a combination of the above techniques, sometimes adding dance choreography that is done in place or while marching. Players may point the bells of their instruments in the direction they are moving, or slide (also called traverse) with all the bells facing in the same direction. Bands that march in time with the music typically also synchronize the direction of individuals' turns, and try to maintain even spacing between individuals in formations (called intervals). Sometimes bands will specifically have wind players turn their instruments away from the audience in order to emphasize the dynamics of the music. Auxiliaries can also add to the visual effect. Backdrops and props may be used on the field that fit the theme of the show or the music being performed. In comedic shows, particularly for university bands, an announcer may read jokes or a funny script between songs; formations that are words or pictures (or the songs themselves) may serve as punch lines. ↑ University of Illinois, Marching Illini Firsts. Retrieved October 17, 2008. Coachman, Frank. Marching Band. New York: Rosen Pub. Group, 2007. ISBN 1-404-20730-9. Garty, Judy. Marching Band Competition. Philadelphia: Mason Crest Publishers, 2003. ISBN 1-590-84539-0. Moss, Lloyd, and Diana Cain Bluthenthal. Our Marching Band. New York: Putnam's 2001. ISBN 0-399-23335-0. This page was last modified on 13 August 2018, at 16:24.